One for Roo. One for you? Friends, the big V is almost here, but you still have the weekend to prepare! 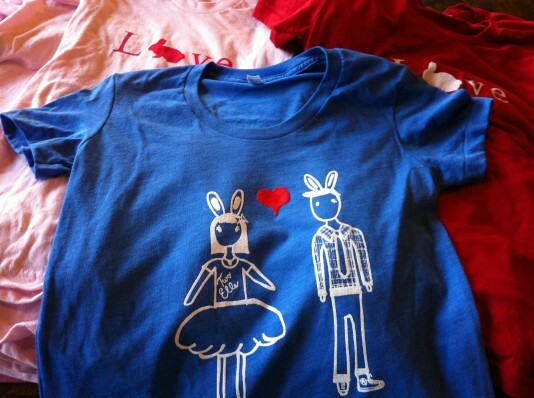 Rachel has already shipped off one of these bunny love tees to Lauren in Brooklyn, and one is on its way today to Amanda (aka Mandi Roo) in Chicago. What can we do to send some Valentines love to you? Friends, to be honest, we’ve made this claim before, but now we have all of Chinese culture making it official. 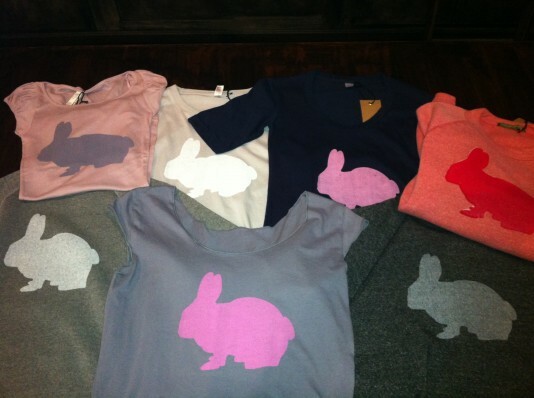 IT’S THE YEAR OF THE RABBIT!!!!! This means that we’re going to bring you any bunny option we can dream up, and you can sport your 2L rabbit with pride as a Chinese-endorsed, official celebration of just how great this year is going to be. Perhaps we’ll even bring you 365 options just to keep the year hopping along! Check out what we’ve imagined so far…..
Friends, our Valentine’s table is starting to look a little lonely! It’s not even February, but apparently you’re ready to love NOW. 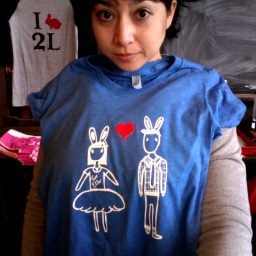 So, we suggest that if you’re looking for some bunny love this Valentine’s Day, you’d better drop by soon…like today….because there’s only one Love sweatshirt left. Yes, we’re a month early, but we feel it’s never too soon to throw some love around. February is right around the corner, and given that it contains Rachel’s birthday, Ricky’s birthday, AND Valentine’s Day, it truly is the month of love. So, start loving early this year, Nashville. We are! With a new year, people often feel tempted to make resolutions, but here in wonderland we’re simply resolved to bring you the same love we brought with our re-invented 2010. Friends, stocking our store with affordable pieces to work into your everyday life will carry over, perhaps even stronger than ever, into 2011. 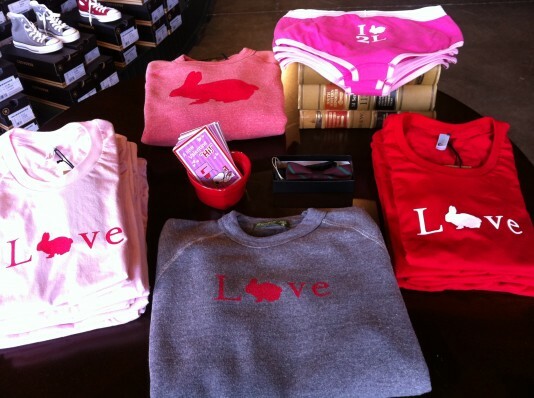 Truly, it will be a year to show your bunny love (as we’re expecting sweatshirts with giant red bunnies on them just in time for Valentine’s Day….). 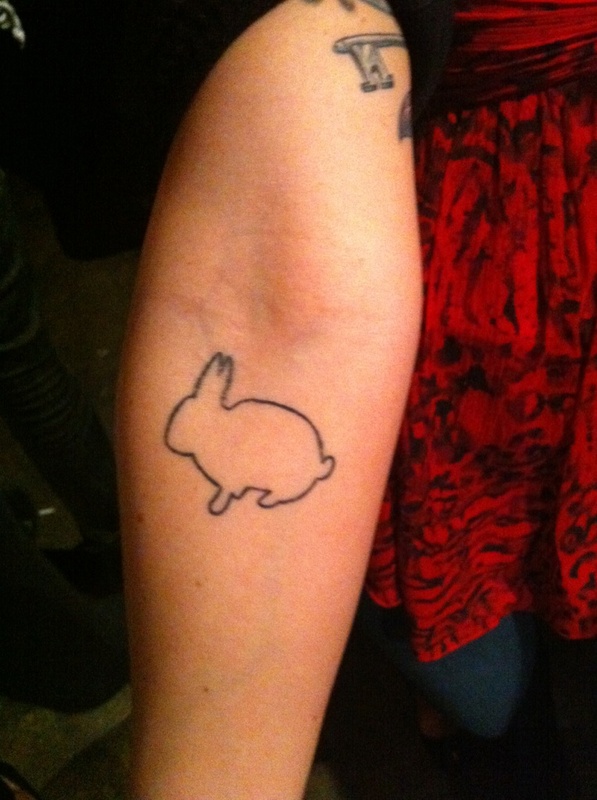 We continue to invent new ways to do so, but one fan took her bunny love to the next level. Now, we understand that only the die-hard fans will go under the needle for us, but feel free to send us pictures of how we’ve stitched a little love into your life, and we’ll just keep sewing our way into 2011.